A robbery at a shipping yard results in a shootout where many people are killed. In retaliation, there is another shootout at a restaurant, courtesy of crimeboss Morgan (Gordon Mitchell), who is looking to take over the territory. Morgan's new girlfriend, Doris (Linda Blair) steals a briefcase with a million dollars in it out of Morgan's safe, which leads to a car chase in which Doris' car is disabled. Doris flags down Steve Baker (Christopher Mitchum), who happens to be in the wrong place at the right time. After fooling Morgan's men with a fake hand grenade, Steve and Doris get away. Luckily, Steve is a movie special effects technician and it will come in handy later on. Doris delivers the money to Morgan's rival Mancini (David Light) and we learn that Doris hates Morgan because he killed her father when she was a child (she witnessed it). Morgan orders his men to pick up Steve, so they go to his house, rough up his wife Kate (Christine Landson) and kidnap her when they realize Steve is not home. Morgan gives Steve 72 hours to return Doris and the money to him or his wife will be killed. Steve begins searching the town for Doris with very little luck until a bartender who Steve questions calls Mancini. Soon, Steve has Mancini's men gunning for him, but he tricks his house with pyrotechnics and special effects, including a remote control pickup truck, which he uses to follow the thugs back to Mancini's home. Steve kidnaps Doris and then finds himself in a whole new pickle. Mancini's men try to stop him from delivering Doris to Morgan, using a rocket-firing helicopter, but Steve shoots it down with a grenade launcher (in one of the film's cheesier effects). He delivers Doris to Morgan, but Morgan refuses delivery because Doris doesn't have the money she stole from him. Morgan gives Steve and Doris three hours to return the money or Kate dies. They must now go back to Mancini's house and steal the money. Stealing the money is easy (maybe too easy) and Steve makes the trip back to Morgan, not aware that Mancini switched the money with counterfeit bills and has shot and killed Doris for her treachery. This is not going to be a pleasant day for Steve and Kate. 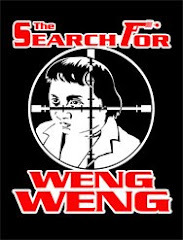 This Philippines-lensed film, a Silver Star Film Company production directed by Jun Gallardo (RESCUE TEAM - 1981; COMMANDO INVASION - 1986), using his "John Gale" pseudonym, is a decent enough diversion, but it is missing much of those wild action setpieces that we come to expect from films of this type. Chris Mitchum is, of course, stiff as a ten day-old corpse, but we don't watch these films for his acting ability, do we? He makes a serviceable action hero and I especially liked the scene where he rescues his wife, they make love and she screams out "Action!" 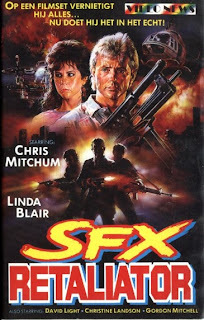 just as she reaches climax (while a "best of" compilation of Steve's best special effects explosions are spliced-in to represent her pleasure!). Speaking of explosions, there are plenty here, as we are shown Steve blowing up stuff in a film he is working on (a Vietnam War film), his truck is tricked-out with hidden machine guns and grenade launchers and he even blows up his own house as a diversion for Morgan's men! There are also plenty of gunfights, a real sappy song plays on the sountrack while Steve searches for Doris (the lyrics repeat the phrase, "Get my baby back" over and over), Gordon Mitchell has a role here that isn't a glorified cameo (like most of his 80's roles) and most of the cast can't seem to remember if Steve's last name is "Baker" or "Becker", as they use both, sometimes in the same scene! 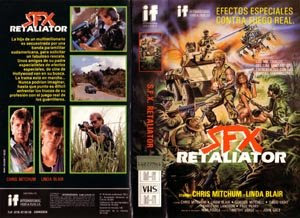 SFX RETALIATOR contains enough weirdness, including the death of Steve's wife, even after all they've been through together and Steve's homemade tank (you gotta see it! ), which he uses in the finale to destroy Morgan's property (Morgan calls the police and says, "No, not thanks, tank! T-A-N-K!") to make this worthwhile viewing. It's no FINAL SCORE (1986) but, hell, what is? At least Gordon Mitchell blows up real nice. Also starring Dave Petterson, Warren McLean, Don Holden and Paul Perry. 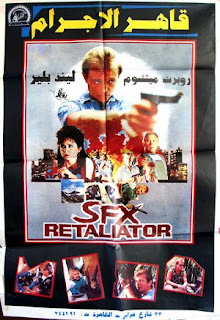 The version I view was a DVD-R ripped from a Japanese-subtitled VHS tape. Picture quality was very good. Not Rated.